Nugesic Tablet: Each tablet contains Thiamine Mononitrate (Vitamin B1) BP 100 mg, Pyridoxine Hydrochloride (Vitamin B6) BP 200 mg, Cyanocobalamin (Vitamin B12) BP 200 mcg. Neuropathy, Neuritis, Neuralgia, Cervical Syndrome, Shoulder Arm Syndrome, Lumbago, Sciatica, Myalgia, Intercostal Neuralgia, Trigeminal Neuralgia and Arthritis. It is also indicated where a deficiency of the relevant vitamins exists. Nugesic should not be used in patients on Levodopa therapy or hypersensitivity to any of the active ingredients. 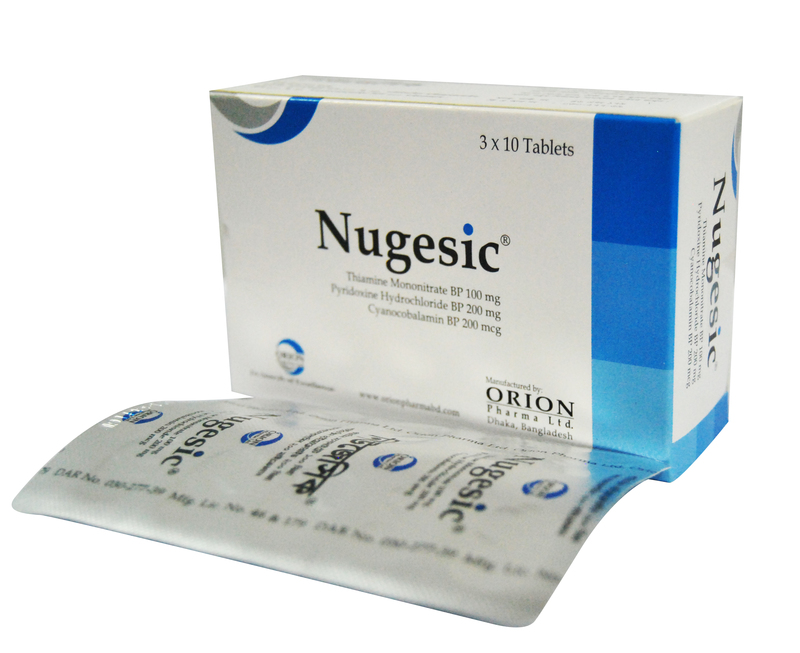 Nugesic tablet may be administered in a dose of 1 to 3 tablets daily or as directed by the physician. Nugesic is generally well tolerated. In rare cases few allergic responses may be seen. No drug interactions have yet been reported. Each commercial pack contains 30 tablets in Alu-PVDC blister pack.